The New York State Department of Labor is rolling out its Rapid Response team to assist the estimated 100 people who lost jobs upon the shutdown of Tonawanda Coke. Labor officials say the prospects for finding a new job in short time are actually quite good. In addition to labor department personnel, representatives of the United Way were present to offer their services. Former Tonawanda Coke workers arriving to the hall were first advised of how to apply for unemployment benefits. Following that session, representatives of several local companies set up and took part in a job fair within the hall. 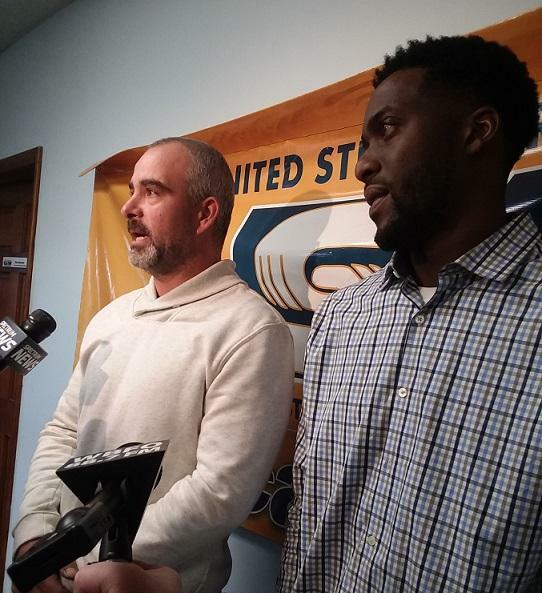 Jason Kambat (left) and Dashaun Young, both former employees of Tonawanda Coke, speak at the United Steel Workers hall in Tonawanda, where they and other former co-workers participated in sessions hosted by the New York State Department of Labor to help them find a new job. "We're here to help them. That's our role, to help them get back and find a new job, a better opportunity for many of them," said Carolyn Bright, Career Center Manager for the Department of Labor. "Some of the individuals were being paid low, maybe 14 or 15 dollars per hour. They'll have an opportunity based on their skills to find better jobs." Labor officials offered an optimistic picture for those affected by the Tonawanda Coke closing. They estimate up to 500 openings are available to be filled at local companies, including those participating in the job fair. Joseph Vertalino, staff representative with United Steel Workers, says those displaced by Tonawanda Coke have several useful skill sets. "The skill set they have is anywhere from electrical and mechanical workers to general laborers," he said. "Some of the facilities we have that are hiring are looking for laborers, general assembly. We're fairly confident we'll be able to place a majority of them." Jason Kambat was an assistant plant manager at Tonawanda Coke and was among those in attendance Thursday morning. Despite losing his job with little notice, he offered his gratitude to his former employer. He was also upbeat, hinting he had a new offer but - saying he didn't want to jinx it - would not reveal his lead. This experience is not new to him. "I thought it was over when Bethlehem Steel closed," he said. "All of a sudden I ended up over here at Tonawanda. They treated me very well. I have nothing bad to say. They were a company where a guy who didn't have a college education could squeak out a meager living, out his daughter through college, have a house." Dashaun Young was a battery foreman at Tonawanda Coke. Unlike Kambat, this is his first experience dealing with the quick shutdown of an employer. He lamented that his 12-year-old daughter is interested in the latest iPhone model and he didn't like having to explain he was out of work. But like Kambat he was optimistic about finding a new job. In the meantime, he was asked if he and his former co-workers had been given their final paychecks. "They did a lot of transitioning with payroll. From our understanding, everyone's going to get paid," he said. "Hopefully that stays like that. But from my understanding everyone is going to get paid. That's what the owner told me personally, that if you're here you're going to be paid to be here." Vertalino acknowledged that workers have not yet received those final paychecks and, with the company filing for Chapter 11 bankruptcy in federal court earlier in the week, there's also the challenge of securing any severance and short-term benefits for former employees. "We have to enter into effects bargaining with the company. There are some clauses in the contract with regard to a severance package and they're also owed any unused vacation time," he said. "With the bankruptcy proceedings now, it looks like we're going to have to do a little work to get what these guys are due." Tonawanda Coke cited financial problems and numerous government regulatory actions for the shutdown. In the coming days, the DOL will be scheduling targeted career fairs for employees. All workers will be contacted through the local mail to notify them of the career fair dates and locations, as well as provide information on services for which they are eligible. "They can come to any of our career centers. Our staff are ready to help them," Bright said. In the meantime, Kambat and Young expressed gratitude to their former employers despite the abrupt end to their positions at the plant. "They gave everybody a chance. They gave everybody a shot," said Young. "I was never in this industry at all. I went from being a schoolteacher to working at Tonawanda Coke. They gave me a shot. They gave everyone a shot." The U.S. Environmental Protection Agency says it is supporting the New York State Department of Environmental Conservation's oversight of Tonawanda Coke's shutdown. To date, air monitoring indicates levels set to protect the public have not been exceeded. The shutdown of Tonawanda Coke is already underway, ahead of the originally anticipated start date of Tuesday. As the ovens are purged and coke is removed from the site, questions are already being raised about what might become of the property in the future. The Town of Tonawanda Supervisor offered an idea for a possible future use - a new stadium for the Buffalo Bills. Tonawanda Coke on River Road continues to face several lawsuits for polluting the air. A community activist continues to speak out against benzene and other toxic material that spews from the facility. "Tonawanda Coke is still polluting," said Jackie James-Creedon, Kenmore resident and community activist in Kenmore-Tonawanda. She said high benzene levels have been reduced, but she wants them reduced even more. "Benzene levels have been reduced. It's better, but as far as what I'm interested in, I'm interested in reducing levels even further," said James-Creedon.